It's not been all bad while I've been away. Back in February I entered a contest sponsored by Georgia Public Broadcasting and America's Test Kitchen (ATK.) They posted three ATK recipes, asking to make one, take a photograph and submit it as the contest entry. 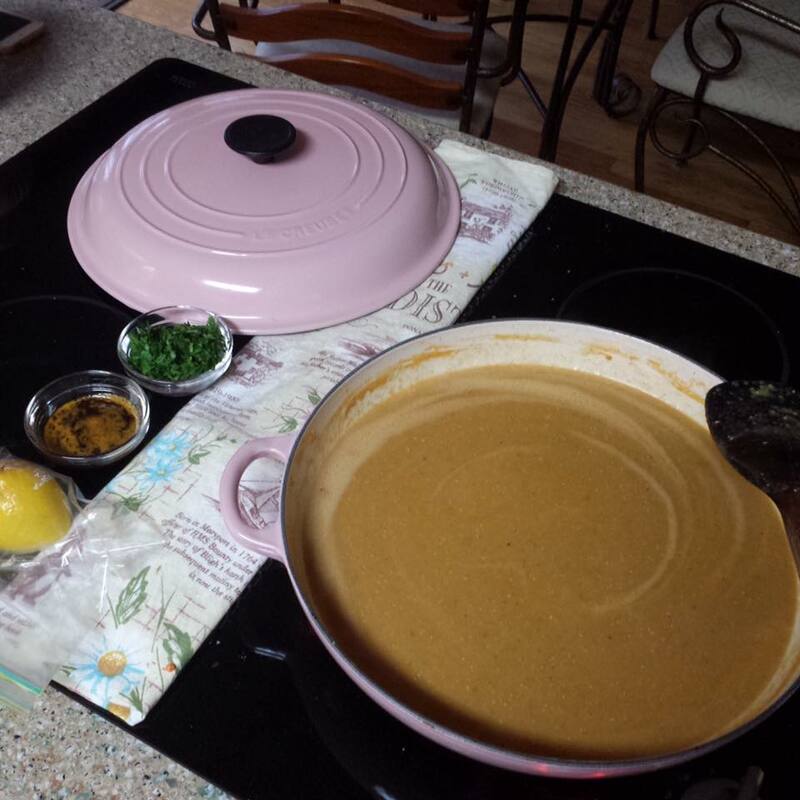 I made the Red Lentil Soup with North African Spices, and submitted this photo on the day before the deadline. The soup was wonderful, and easy to prepare. The next evening I checked my e-mail and found that I was one of the three grand prize winners! 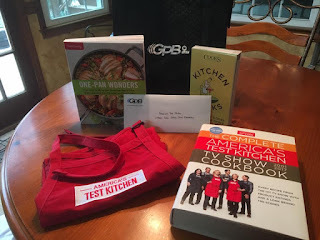 I won the amazing prize pack of cookbooks, membership to the online cooking school, and the signature America's Test Kitchen red apron. And best of all, I was invited to a dinner with Bridget Lancaster and Julia Collin Davison, hosts of the show. If you're a foodie and a home cook like I am, you know how exciting this is. 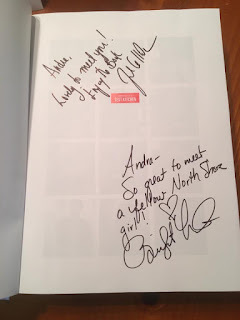 Bridget is one of my cooking idols, one of my fantasy "three for dinner" along with Ina Garten and Anthony Bourdain. The dinner was held at Better Half in Atlanta, the winners of the contest were there, along with some of the local supporters of GPB (aka big donors.) They showed us a wonderful time, the meal was fantastic, all from the America's Test Kitchen cookbook but with a special twist by chef Zach Meloy. I got to have a couple of conversations with Bridget! She lives up in the north shore of Boston and it was so great to visit with a home girl. 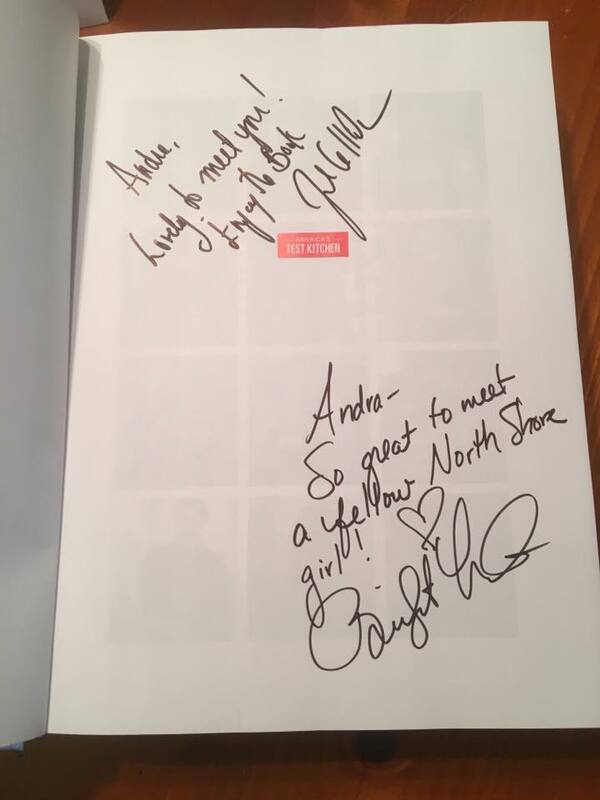 And she and Julia signed my cookbook. It was a really special evening. I still smile when I think about it. By the way, my hair is purple now.